It's an inevitable scenario, really. 7:00am closet session. Rich, dark colored blouse. Comfy and flattering. A great price at J.Crew. Deodorant. A necessary part of life, in all its whiteness glory streaked along essential areas of the top that's the must-wear item of the day. Forever many times more than I want to recount I tried a damp washcloth, which is a sneaky solution, because at first, it looks like it works and you're in the clear. Once it dries, however, the inconspicuous white streaks reappear. SO. ANNOYING. Galloping in to save the day is the blue (I mean maybe it comes in other colors too) foam that holds garments onto your dry cleaning hanger. It works miracles on deodorant streaks. 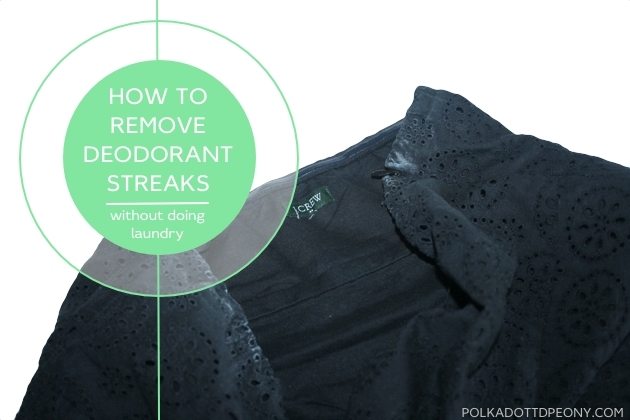 Just remove it from the hanger, and gently rub it on the streak. Now wait for the miracle. New uses for old things. Don't you just love it? 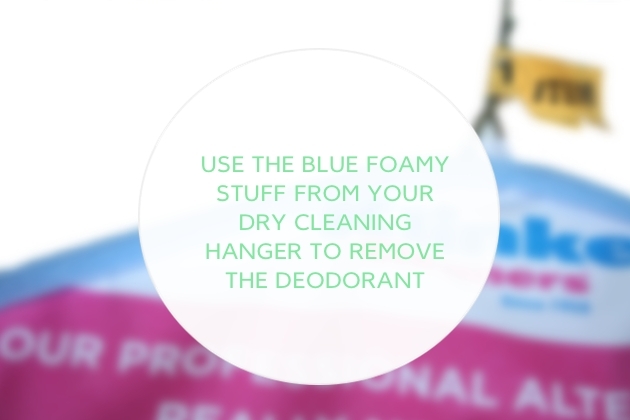 Since I'm a white-plastic-hanger-only in the closet kind of gal, I toss the dry cleaner hangers, and keep just the blue foam in a zipper-bag in my closet, so it's ready to use whenever the opportunity presents itself. Real Life: I JUST used this solution couple of weeks ago for a wedding that I had not prepared for in advance. Pink taffetta dress. Deodorant streaks. Wedding-wear for same evening. What other super fun and surprising tricks can you tell me about? I just love a good trick! PS. Did you know deodorant is spelled deodOrant, and not deodErant? Who knew?! PPS. hey hey! your friendly neighborhood blog is now on Facebook! meet me there for exclusive content.